Lake County is a county in the U.S. state of California. As of the 2010 census, the population was 64,665. The county seat is Lakeport. The county takes its name from Clear Lake. Clear Lake is the largest natural lake entirely within California. Lake County is surrounded by 6 counties. Napa County is to the south. Sonoma County is to the south west. Mendocino County is to the north west. Glenn County is to the north east. Colusa County is to the east. Yolo County is to the south east. Lake County is north of the San Francisco Bay Area. 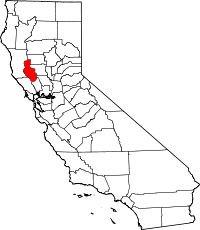 Lake County was formed in 1861 from parts of Napa and Mendocino counties. The U.S. Census Bureau estimates that the population was 64,184 in 2014. In September and October 2015, a wildfire called the Valley Fire burned more than 76,000 acres of land in Lake County, Napa County, and Sonoma County. The fire destroyed almost 2,000 buildings and threatened almost 7,500 buildings. The fire killed 4 people and left 3,000 people homeless. The damage is estimated at "hundred of millions of dollars". ↑ "Lake County". Geographic Names Information System. United States Geological Survey. ↑ "Snow Mountain". Peakbagger.com. Archived from the original on May 2, 2015. Retrieved April 9, 2015. ↑ 3.0 3.1 "State & County QuickFacts". United States Census Bureau. Retrieved May 26, 2014. ↑ "Feature Detail Report for: Clear Lake". Geographic Names Information System (GNIS). U.S. Department of the Interior. U.S. Geological Survey. 1981-01-19. Retrieved 2015-10-09. ↑ "Lake County". California State Association of Counties. 2014. Retrieved 2015-10-12. ↑ "Clear Lake Is Unique". Official Website of the County of Lake. County of Lake. 2013-09-13. Retrieved 2015-10-09. ↑ "California County Map". CSAC.org. California State Association of Counties. 2014. Retrieved 2015-09-22. ↑ "Lake County, California". Genealogy Trails. 2006. Retrieved 2015-10-09. ↑ "State & County QuickFacts: Lake County, California". quickfacts.census.gov. U.S. Census Bureau. 23 September 2015. Retrieved 2015-10-09. ↑ "Valley Fire Incident Information". CalFire.gov. State of California. 2015-10-06. Retrieved 2015-10-12. ↑ "Valley Fire Fully Contained". Capital Public Radio News. Capital Public Radio. 2015-10-07. Retrieved 2015-10-12. ↑ "California fire updates". Los Angeles Times. Los Angeles Times. 2015-09-17. Retrieved 2015-10-12. ↑ "Valley Fire Update". KQED News. KQED. 2015-09-23. Retrieved 2015-10-12. This page was last changed on 4 September 2018, at 23:21.